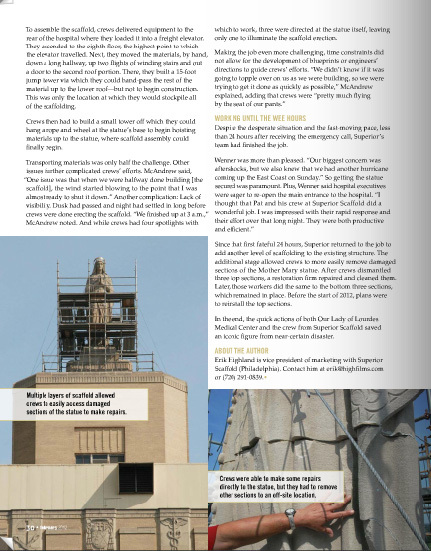 Superior Scaffold is in the center of the latest issue of Scaffold & Access Industry Magazine for the work we did on Our Lady of Lourdes Medical Center. 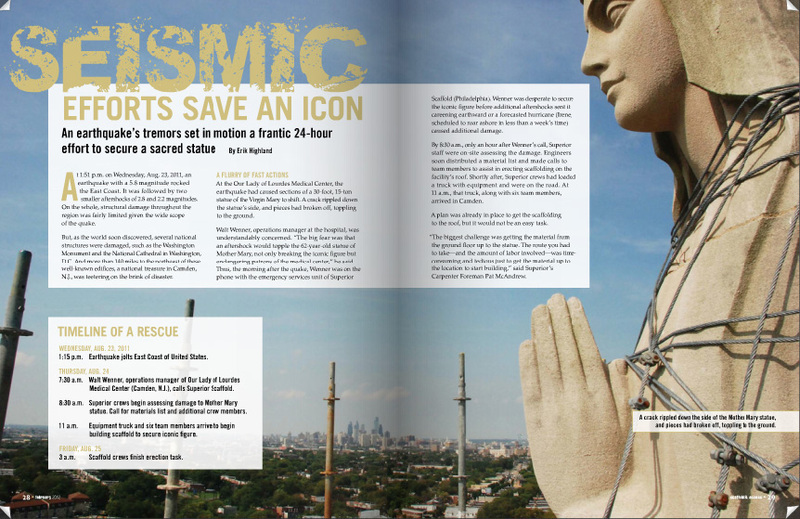 As we blogged before, it was all about how we secured the beloved statue on top of the building after the earthquake. Props go out to Gina Kellogg of SAIM – she did a great job! Posted on March 1, 2012, in Frame, News & Updates and tagged article, Camden, earthquake, erection, facebook, flikr, frame, magazine, Medical Center, Mother Mary, News, NJ, Our Lady, philadelphia, Philly, Rental, rentals, report, scaffold, scaffolding, Service, statue, twitter, update, Virgin Mary, youtube. Bookmark the permalink. 2 Comments. Thanks for the kudos on the article! It was a fantastic and compelling project! I was glad to be able to lend a hand in sharing the story with the industry!